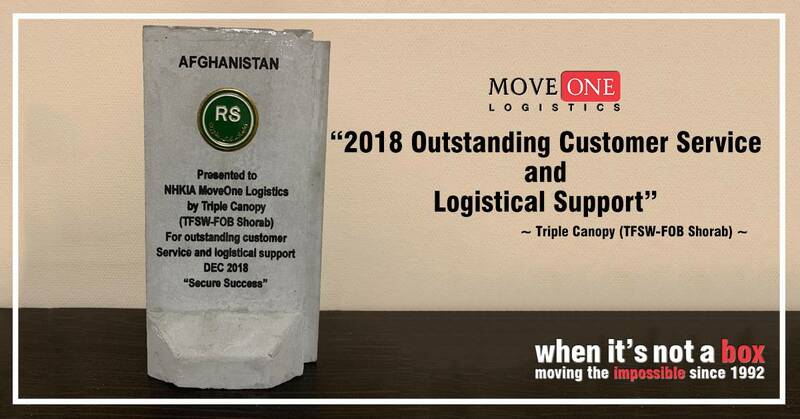 In December 2018, our Move One team at NHKIA (North Hamid Karzai International Airport) Air Base in Kabul assisted Triple Canopy with some mission critical logistical solutions in support of their current project in Camp Shorab in Southern Afghanistan. Triple Canopy were so pleased with our assistance that they awarded our team in NHKIA with an engraved mini T-Wall trophy to recognize our support. Special mention for this award goes to our Operations Coordinator on KAIA, Mr. Dejan Hadzic, who was key to solving these challenges for Triple Canopy. A T-wall, is a twelve-foot-high (3.7 m) portable, steel-reinforced concrete blast wall of the type used for blast protection throughout Iraq and Afghanistan. The name is believed to have originated from L. Paul Bremer of the Coalition Provisional Authority, who was the Director of Reconstruction and Humanitarian Assistance for post-war Iraq, following the Iraq War of 2003, in the early years of the Iraq War.